eBay customer? Check the Advertising Preferences! If you are an eBay customer, either as a seller or buyer, you may want to check the advertising preferences on the site if you have not done so in the past. The marketplace eBay, just like Amazon and many other shopping related services on the Internet, displays advertisement to customers that browse the site. The company has partnerships with advertisers and may collect and share information while customers use services operated by eBay. 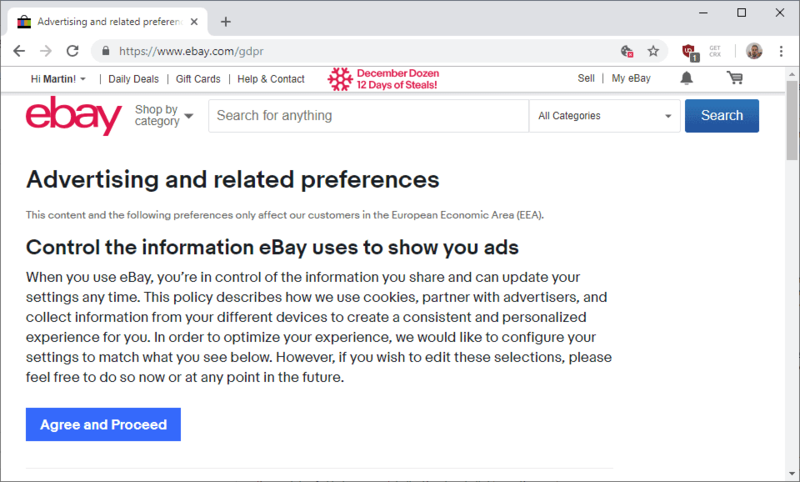 If you want to keep collected and shared data to a minimum, you need to check the advertising preferences on eBay and turn off anything there; all options are checked by default which means that data is collected and shared with partners. First thing you need to do is open the GDPR page on eBay. You can use the link in the previous sentence or select My eBay > Summary > Account > Advertisement Preferences to go there manually if you prefer it that way. Information about the operating system. Information about other identifiers "assigned to the device". Information about user activity, e.g. visited web pages or used mobile apps. 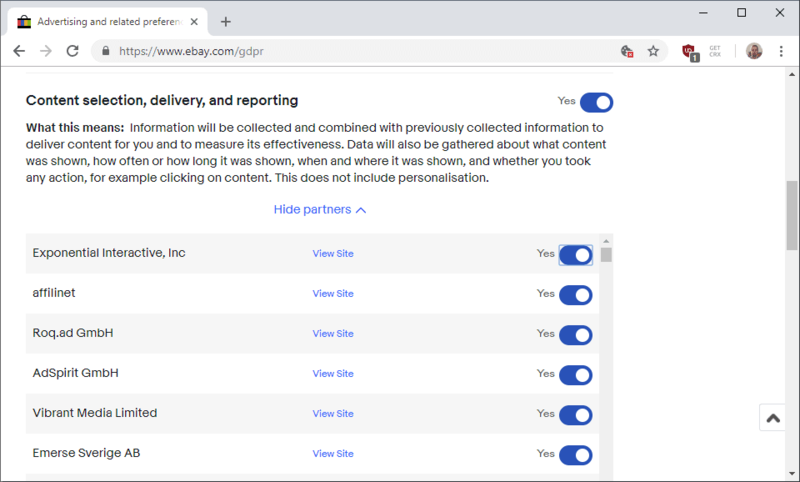 Content selection, deliver and reporting -- eBay collects data about "what content was shown, how often or how long it was shown, when and where it was shown, and whether you took any action". Website improvements -- eBay measures, analyzes and reports on how eBay is used by customers, and how it can improve the site and services. Google advertising -- Google drops cookies on user devices and may collect information about the device and use on the site. Storing and accessing information on your devices -- eBay may store data on user devices related to advertising activity. The company may collect information about the computer or mobile device. Ad selection, delivery, and reporting -- eBay collects information about interests to "measure the effectiveness of advertisements". Personalizing advertising based on your behavior -- activity information is used to personalize advertisement. Each option has an on/off toggle and a "show partners" link. A click on the latter displays all third-parties that eBay shares information with. Some list dozens of partners and sharing is enabled for all of them. It is unclear if toggling "no" blocks sharing with partners; if you check the partner listing after toggling a preference to no, you will notice that all partner sharing options are still listed with the status "yes". The changes apply to any eBay store once you make them. Now You: Do you use eBay? Thanks for this, Martin. As you say, It is unclear if toggling “no” blocks sharing with partners; if you check the partner listing after toggling a preference to no, you will notice that all partner sharing options are still listed with the status “yes”. I’m not happy about that. I had a similar experience on all three of the sites. Seems they are pretending to follow rules, but hey, if there is a problem with the technique ……. Nice deceiptive way to do what they want to do. And that is making money with our data. Not unusual. Opt out leaves cookies in your browser which do what, who knows. Their “explanations” have been the same forever, pure BS. As near as I can tell, that opt-out system is very, very close to being utterly worthless. It’s disgusting that companies are selling your information to so many that it takes you 5 minutes to toggle them all off. As for this one there are lots that just say “Requires opt out”, what’s that mean? Is that you setting the main category to no or opting out with each company, which you won’t be able to do as an individual (very facebook like). Just another reason to use the Tor Browser everywhere. Disgusting. That will tell Ebay partners even more about you. The metadata is what’s interesting (= “uses Tor”). What’s more effective is only using a separate machine/browser for shopping logins. >That will tell Ebay partners even more about you. The metadata is what’s interesting (= “uses Tor”). What’s more effective is only using a separate machine/browser for shopping logins. Using another machine and browser on the same internet connection won’t change your IP address, but Tor will. Using Tor or not is just one bit of information, the IP address identifies you much more. The TB sends a lot of false info about your device. Regularly changing its IP’s (every 10 minutes or so), uses multiple DNS resolvers and blocks cookies. I see no other alternative to “fight” these spying methods. Ebay already knows what you have bought they can offer you similar results based on that why let them getting everything else. It’s not a big thing use tor because you are logged and they hold all your data. They can keep mining with your shop history and related searches. Using tor will not help you if you’re shopping on eBay. You probably have an eBay account and you probably use the banking system to pay for purchases, Both of those thing let eBay know precisely who you are anyway, making Tor irrelevant. Sure, giving the site one’s real name, delivery address, phone number, credit card number… makes Tor irrelevant to be anonymous, of course. But using Tor the rest of the time helps to prevent connecting the rest of one’s browsing with one’s shopping identity. @Anonymouis: That is already taken care off by simply deleting cookies, or similar measures like content blockers. No need for Tor when it comes to corporate surveillance. Tor is suited best against government surveillance. If I had a need to investigate someone, the fact that they use TOR would be a good indication they think they have something to hide. Child molester? Drug dealer? Terrorist? True, but as user17843 says, Tor is overkill for this purpose. I’m not discouraging you from using Tor, though, as the more people that use it, the greater the security for all Tor users. What a vast data mining center; even if one toggles some of the companies beneath each category, there are another 50% that require one to visit the “opt out” page and turn off the tracking. Interesting problem to address. Wonder how many of the companies are on the HostsMan block list. There’s a large Agree and Proceed button that appears to do nothing useful… toggling the yes buttons to no actions the change immediately. Odd. Unbelievable. What an eye opener. Thanks, Martin. It boggles the mind to the shear number of those partner companies. Like others above have said its unclear if the top ‘no’ covers the partners. Have to go through each partner section and chose no just in case. If the top “no” doesn’t cover all the partners than it’s less than useless(which it pretty much is). I’m fairly sure that it does unsubscribe those that have radio boxes, however, the number of partners that require you to ‘opt out’ by individual request(not via the radio boxes) makes the whole business rather idiotic and pointless. Your choice is use the site and be thoroughly tracked or quit shopping there. There is no practical third choice. Of course this applies to virtually all shopping on the web. It’s the price you pay to save a few bucks vs brick and mortar. Absolutely disgusting Ebay uses that many companies to track and try to modify someone’s online surfing. I just registered and made two purchases and when they arrive I will flee Ebay like it has the plague. Thanks Martin I would’ve never known to check. Thanks. I had been through privacy settings before but never found that one. All options were still switched on for the .au website and had to be done separately. Interesting. I have not noticed this pattern so far. But maybe you’re right. I use eBay mainly through the app and so far could not detect why these privacy settings keep resetting. Thanks, Martin, wasn’t aware of this. I went through every company and turned off the ones that had buttons even though I’m not in EU but do buy from EU. There’s an older page of settings, Site Preferences, I think, too, that allows/disallows personalized ads, third parties and some other stuff. Interesting thing with the EU companies is about half of them are opt-out. Something makes me think these are replicates of the ones with buttons, their “Opt Out Only Divisions.” No matter, these buttons only control what ebay shares; any of them that can’t be turned off can sell info collected on ebay to another company. Seems GDPR has a major loophole with Opt-outs only still extant. Who’s going to convince me ad blockers are playing dirty? Who are all these companies advertising to? Other advertising companies? I never click ads or even pay attention to them. Thanks Martin. Amazon has similar settings, too. Guess what the defaults are. This is something I can’t stand and as soon as I read this went and changed every box (I thought I was going to need an overnight bag) from Yes to No and even checked again. Today I have 12 checked from No to Yes, maybe I missed these but I don’t think so. thank you Martin for this, certainly new info and thought i had disabled all. they know what i bought and sell, so can be ok with that info gathering, however, all the rest is beyond realms of my agreement with them. Thank you for this interesting piece of information. I quickly went do my eBay page and disabled all options and “partners” as well. Oh how i dislike the horrendous Opt Out believe brought upon us all… unwaranted advertising is a most unethical business…. any way, i then went to one of the Opt Out sites and checked what was happening there. It goes to check for more than 100 advertising sites and the impact on my (is it mine?) browser. In general i really would wish for a world free of advertising in all public spaces… it would liberate us all and free our minds. Yes, but I always feel a little dirty when I do. When I need to buy something and can’t find it anywhere else, I’ll end up at eBay. Back in the day, I was never off eBay. But I haven’t used them now for a couple of years – imho they lost the plot a very long time ago. Stop thinking eBay bargains – these days think Chinese crap and data mining. Guys! You need to visit these toggles every two weeks or so, because eBay _KEEPS RESETTING_ them. I had to go through all toggles for the 4th time today… Usually, after about two weeks, when I go back to check on these settings, I find that they have all been re-enabled again. In my case, they toggle every time I close and re-open Chrome. Chrome has extension ABP and Click & Clean extensions. The latter is set to kill cache and cookies (and just about everything else when the browser is closed). Maybe if I didn’t do that… Nah! then they’d cat ch me out via cookies. On Dec. 8th I unchecked everything that could be set to NO from Yes, Dec. 9th I found some set back to Yes. Today I found everything in: Content selection, delivery, and reporting – Website Improvement – Google Advertising, Storing and accessing information on your devices – Ad selection, delivery, and reporting – Personalizing advertising based on your behavior, has been set back to Yes. Everything has been set back to Yes so it looks like you can’t Opt Out of anything. Almost the same except I lose the settings if I close and re-open the browser. Click & Clean is set to automatically clean up when the browser closes. I didn’t bother testing. Obviously, if they don’t get you one way they do get you another. eBay response to a complaint may be interesting.